So earlier today I wrote a frantic post about how annoyed I was when I found out another blogger with a post 95% similar to mine. Yes, I said another because oddly enough this was not the first time a blogger has copied from my post. If you're going to put my original content on a public website, you should not be afraid that you're going to be publicly called out. Anyways, for those curious cats out there, I want to provide you with a little update. The blogger, Angela from Hair Spray and High Heels, actually got in contact with me to tell me her side of the story. Quite in depth actually but I really appreciated that she took the time and effort to clear things up with me. She is actually quite a nice lady and I feel terrible for going on a rampage about something that she wasn't even fully aware of. She did a little investigation of her own and found out that it was the "blog designer" she hired from Craiglist that copied from my blog. When Angela asked this "designer" to send her some banners for "nails inspired by fashion" to see if she would reference my blog, and indeed the designer sent her my banner. Anyways, I'm on to you "Caryn". If I see anything that's similar to my blog, I'll be sure to check up with the writers first. Everything is settled with and we can move forward. I want to apologize to Angela for my post earlier this morning. What this "blog designer" did was completely unfair to both of us. I hope that people who hired her will do their research and make sure what this blog designer has done for you is original work. Crazy.. I was going to say.. I read the post and just like that it was gone! I would prally be frustrated also if someone was copying my work.. not cool! I contacted Yahoo directly about my issue since all I had was her e-mail adress and the criaglist ad. I explained to them in great detail what went on and they contacted me almost immediately. They were able to find an actual site she had set up with some things from Sam's site and (not shockingly) about 10 others. They SHUT HER DOWN. I just wanted to say thank you for bringing it to my attention again to Sam!! It really shows that you have to be super careful with who your trust and I'm glad Yahoo handled it so appropriately! Hopefully this prevented some other people from getting duped!! I had another blogger contact me because she found Caryn on a blog hop or something and had her design her header and when she saw my Facebook status about it she looked into and sure enough it was someone else's. So sad that someone would do this. Also so grateful to Samantha for allowing me to keep the design and credit her. SKETCHY people these days. My goodness! Thanks for the update Ange! Right? I can't even believe she had an entire site set up with other people's work. Nowhere near ok.
Nope! But I guess I should be a little flattered that my writing, formatting, and design is good enough to be taken from. I'm glad though that you got it worked out with the blogger herself... But the fact remains that someone there (the designer) was being dishonest. 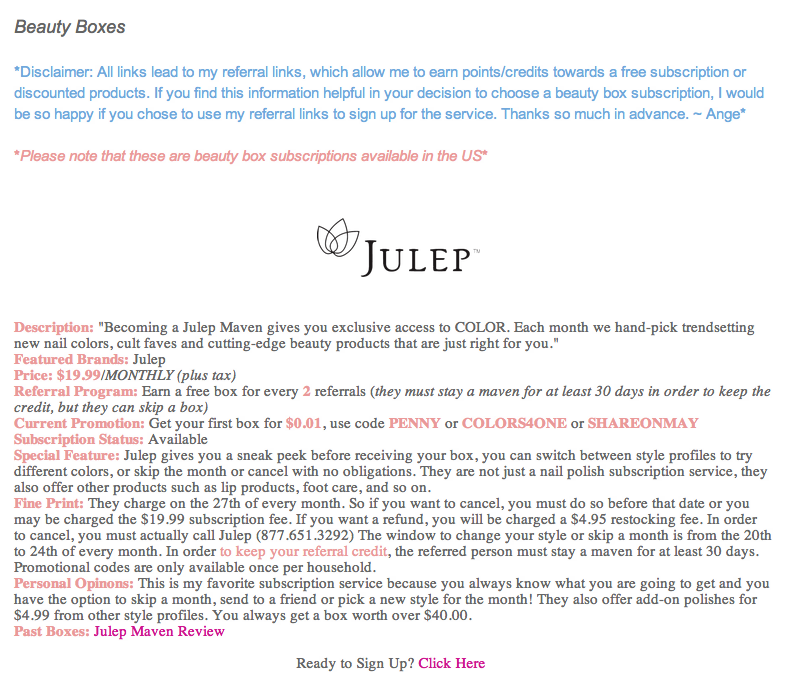 My First Giveaway: Julep Intro Box!